While overall official development assistance (ODA) levels have stayed relatively stable over recent years, the amount of aid given as budget support has gone from representing over 18% of total aid to around 5%. Aid flows to Uganda have been relatively stable since debt relief peaked at US$5.9 billion in 2006, ranging from US$1.6 billion to US$1.8 billion per year between 2008 to 2012. 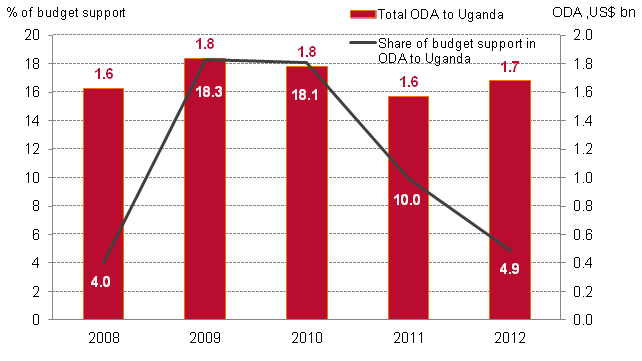 Budget support represented as much as 18.3% of ODA flows to Uganda in 2009 and 2010, this fell in both 2011 and 2012 to stand at just 4.9% in 2012 – notably, while overall aid going to Uganda increased in that year. With 20% of the Ugandan population living in chronic poverty, aid is needed to continue to address issues facing the poorest communities. Uganda will not become economically independent until its economy builds a larger tax base to raise more domestic resources. 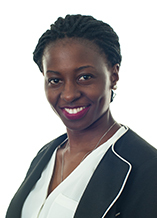 This is the second in a three-blog series on Uganda’s budget. Read the first post: Aid accounts for a falling share of Uganda’s budget. In tomorrow’s blog, we look at the changing proportions of aid going through NGOs, the public sector and multilateral bodies. All OECD figures are gross disbursements in constant prices.